When evaluating the cost of flash technologies as a component of an enterprise storage environment, a longer term holistic view should be taken, one that focuses on the total cost of ownership (TCO) rather than exclusively on the hardware acquisition cost. This perspective enables customers to validate the value of flash products over the long term and can prove to have a markedly lower TCO when compared to an environment relying exclusively on spinning media. This paper explores several of the total cost of ownership (TCO) benefits associated with flash storage compared to those of traditional hard disk storage environments. 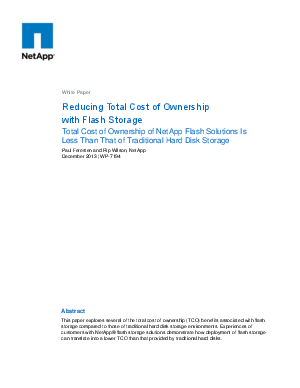 Experiences of customers with NetApp flash storage solutions demonstrate how deployment of flash storage can translate into a lower TCO than that provided by traditional hard disks.